Entrekra, the Monaghan and California based design, engineering and home manufacturing company providing off-site framing for both residential and commercial construction has launched its European headquarters in Monaghan. Speaking today Entekra CEO, Gerry McCaughey, said, “Today marks a pivotal day not only in the life of Entekra but also in terms of how house construction in the USA will be shaped into the future. 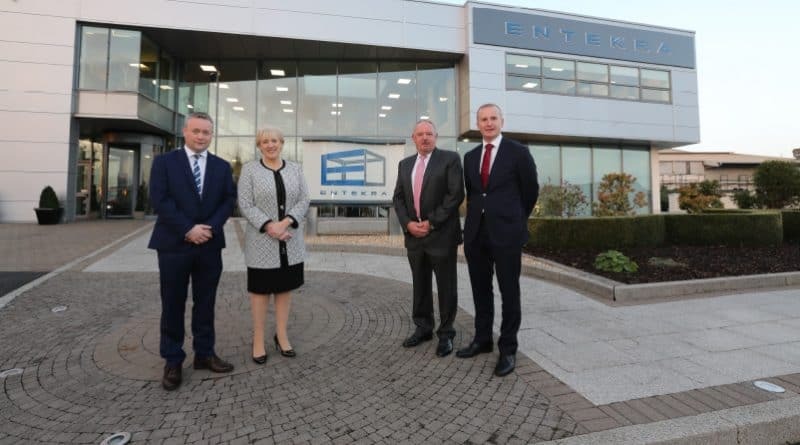 The opening of this wonderful facility allows Entekra to grow and expand our staffing levels in Ireland to cater for the overwhelming demand being generated for our product in the US market. Officially opening the new facility, Minister for Business, Enterprise and Innovation, Heather Humphreys TD said: “I am delighted to be here in Monaghan on what is a hugely significant day for the local community, county and country.